Mecidiye Kiosk was built during the reign of Sultan Abdülmecid (1839-1861) at the Topkapı Palace. The name was derived from the Sultan’s name. It is also referred to as New Kiosk (Yeni Köşk) as it was the last important building to be constructed on the palace ground. The structure reflects the influence of the 19th century European Art. The Architect of the rectangular kiosk is Sarkis Balyan. 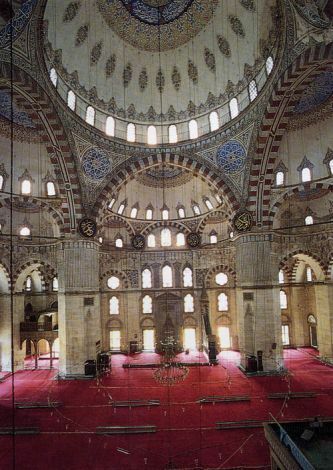 This site was formerly occupied by another building constructed by the Sultan Mehmed II, the Conqueror. The basement of this structure seats on a retention wall dating from the Byzantine time. The wall is made of coarse sandstone. The interior is lighted through large windows. There are three entrances on the main front. The middle gate leads to a staircase descending to the basement. To the left, there is the Selamlık, Mabeyn section. The kiosk commands a panoramic view, which stretches the angle vision to comprise the Princes Islands and the Marmara Sea. It has also a wide terrace paved with marble slabs.